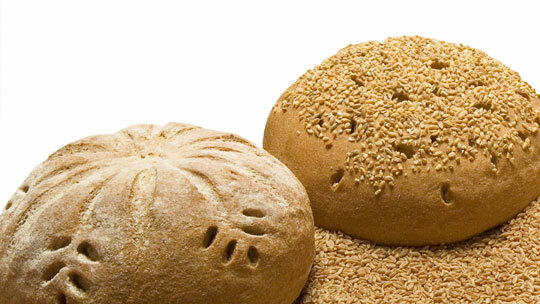 A common question I hear is "what is the difference between white flour, enriched white flour and whole grain flour?" Since this month is National Flour Month, it is time to tackle this simple misunderstanding. Every grain starts out as a whole grain and has three parts: the bran, the germ and the endosperm. Milling the grains to make flour just puts them into a more usable form. Whole grain flours stop here and are whole grains because they still have all three parts of the original grain. White flour has a little more processing to remove the coarse bran and germ (which has some healthy unsaturated fats that go rancid if left too long). Unfortunately, removing the bran and germ also takes away a lot of the vitamins and nutrients. The B-vitamins - thiamin, niacin, riboflavin and folic acid, and the mineral irons and sometimes calcium are added back into the flour to make enriched white flour. All the versions of flour have some health benefits but whole wheat flour is by far the best. It is not only in a more natural form but has all of the same nutrients found in the original grain. Whole grain flour has 17 more nutrients and 25% more protein than white flour. But like all foods, nutrients start to leave as they sit on the shelf (unless a few chemicals are added), that is why all of the Great Harvest bakeries mill their flour fresh each and every day inside the bakery and use the flour within 48 hours. Unbeatable fresh taste, superior whole grain nutrition - that is the Great Harvest way. What other questions do you have about whole grain flour?